Currency pair Euro Dollar EUR/USD completes the trading week near the 1.1314 area. The pair continues to move in decline. Moving averages indicate a bearish trend. At the moment, we should expect an attempt to continue growth and test the resistance area near the 1.1385 level. Where is expected to rebound and the continuation of the fall of the euro/dollar. The potential target of the decline is the area below the level of 1.0765. 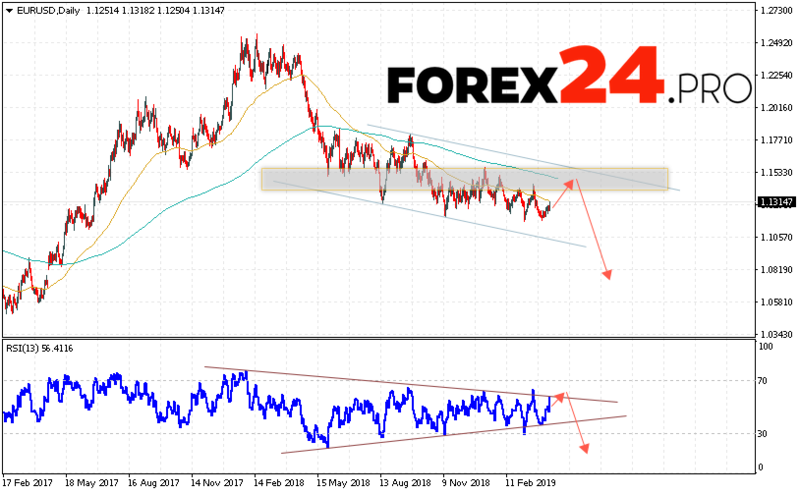 In favor of the fall of the EUR/USD currency pair at FOREX, a test of the downward trend line on the relative strength index (RSI) will come out. The second signal may be a rebound from the upper boundary of the downward channel. Cancellation of the option of falling quotations of the pair Euro/Dollar in the current trading week on April 15 — 19, 2019. A strong growth and a breakdown of the level of 1.1565 will become. This will indicate a breakdown of the upper boundary of the downward channel and the continued growth of the pair in the area above the level of 1.1785. With the breakdown of the support area and closing of quotes below the level of 1.1135, we should expect confirmation of the development of a downtrend in the pair. Among the important news from America and Europe in the next trading week, which may have an impact on the EUR/USD rate, it is worth highlighting: The index of economic sentiment in Germany from ZEW, The change in the volume of retail trade. EUR/USD Forecast and Analysis April 15 — 19, 2019 suggests an attempt to test the resistance area near the 1.1385 level. Where can we expect to continue the fall of the pair in the area below the level of 1.0765. A trend line test on the relative strength index (RSI) will be in favor of the fall. Cancellation of the option to reduce the euro dollar will be a strong growth and the breakdown level of 1.1565. In this case, we can expect the pair to continue to grow with a potential goal at the level of 1.1785.